Although photos recently surfaced of GUNS N' ROSES guitarist Slash in a studio, the legendary axeman may not be recording material for his next solo album, as previously speculated. ALTER BRIDGE singer Myles Kennedy, who also fronts Slash's solo band, MYLES KENNEDY AND THE CONSPIRATORS, was a guest on the May 2 episode of the "Trunk Nation" show on SiriusXM channel Volume (106), and he was asked if there are any plans for SLASH FEATURING MYLES KENNEDY & THE CONSPIRATORS to work on the follow-up to 2014's "World On Fire" album. He responded: "Honestly, I don't know what's gonna happen. 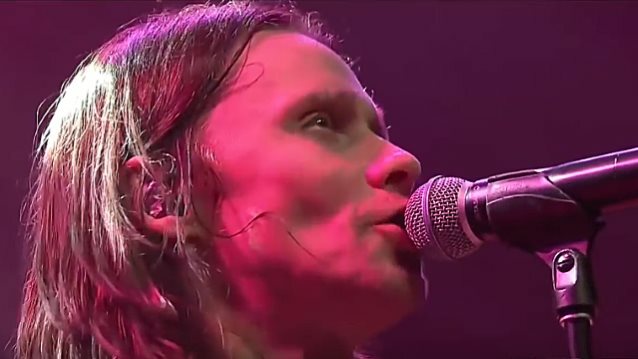 I'm kind of knee-deep right now with ALTER BRIDGE, and I've also been working on another solo record of my own." Myles also talked about his decision to begin work on his second solo album, even thought the first one has yet to see the light of day. The current GUNS trek — which features Slash and fellow original members Axl Rose and Duff McKagan — launched in April 2016 and has since grossed more than $230 million, with more European and North American dates coming this spring and summer. Despite the success of the tour, there has been no indication that GUNS intends to record a new album. The last GUNS studio album, "Chinese Democracy", came out in 2008 and featured only Axl Rose from the band's classic lineup. The last album on which Rose, McKagan and Slash appeared together was 1993's covers set "The Spaghetti Incident?"